Hello everyone! I hope you are doing well! This review was supposed to go up a while ago, but there's been a lot going on and as I'm sure you can tell, I'm a bit behind. I am very sorry about that. CARD.com is a website where you can pick out your OWN pre-paid debit card. There are thousands of different cards you can choose from. From your favorite animal, favorite TV show character or you can even represent your favorite cause! There is no credit checks, overdraft fees, check cashing fees, late fees and you will have access to ATMs worldwide! On top of all of that you can use this card anywhere that Visa or Mastercard is accepted! 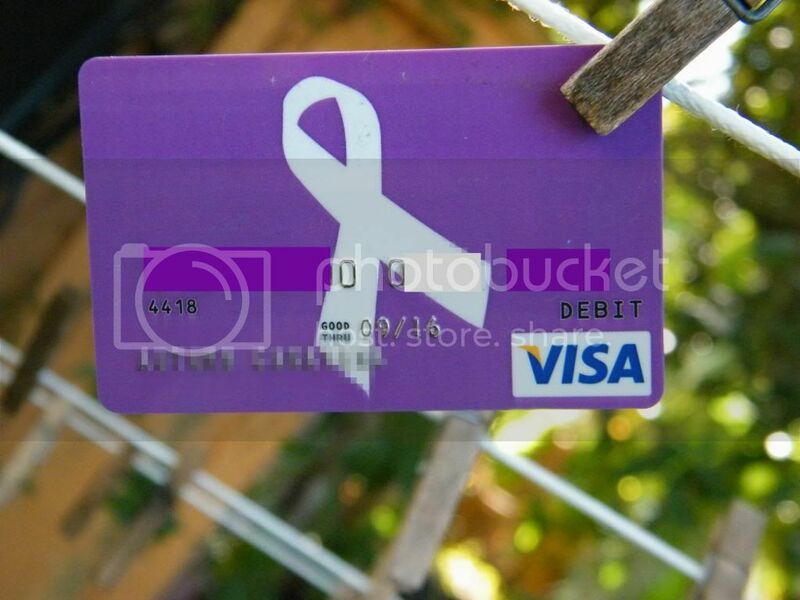 The card I decided to go with was the purple card with a white ribbon for Suicide Prevention. 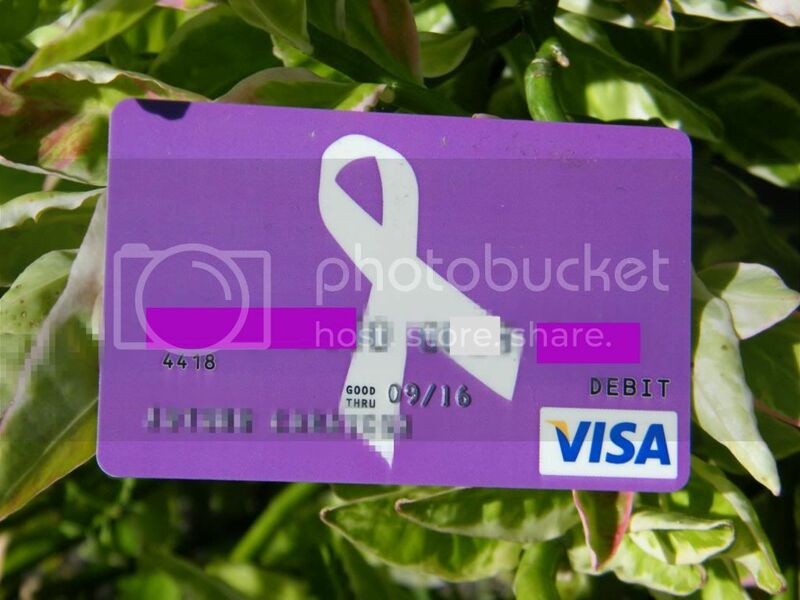 There are two different cards, the one I chose and one that is a white to light purple gradient card with the purple ribbon. The reason that I chose this card is because it is something that I have dealt with in the past. There has also been an excessive amount of young people taking their lives in the past couple of months. It's a total shame and it NEEDS to be stopped. Alas, we shant go on a tangent about that right now. Signing up for your card is VERY easy. You give them the basic information, like you would when signing up for a credit card. After I filled out the information for my card, it took less than a week for the card to get to me, which I thought was very quick. I expected it to take longer actually so I am extremely pleased. If you're concerned about signing up for a pre-paid debit card from this site, don't be. They are a member of the FDIC, just like banks so you know they are legit. Since the card is pre-paid you can add more money onto it in various ways. Direct deposit, Pay Pal, Western Union, through your bank and through MoneyPak. So, it's very easy to reload your card. Now there is a monthly maintenance fee of $5.95, unless you get at least $800 worth of direct deposits during the month. That's pretty standard actually, and it's also pretty cheap. I think the monthly fee from Regions (Chris' bank) is $8+, I don't really remember what it is. I absolutely LOVE my card and have absolutely no shame in using it. When you get your card in the mail and you activate it, says that your money will be available by the Friday after you activate it. Now, I activated mine ON a Friday so I didn't expect any money to be on it for a week. To my surprise my money posted probably 4 days after it was activated which was pretty awesome. It came at a perfect time. You may think my first purchase would have been makeup related right?! Yeah, not! I actually got go-go juice for my car. All in all, I recommend CARD.com. Not just because of their gigantic selection of cards, but because they are reliable, easy to use and the people behind the company are amazingly nice. On a sidenote, now I totally wish I got the Spock card. I'm such a nerd. By Spock I mean Leonard Nimoy, not the dude who plays him in the new movies. Mmmm original Spock, me gusta! Don't forget to check out their Facebook and their Twitter! What do you think? Would you ever sign up for a pre-paid debit card?! Disclaimer: This post is sponsored by CARD.com. I was compensated for this post, but all opinions are 100% my own. I would never post about something that I didn't like nor agree with.